In this article we are going to learn the process of creating one to one mapping in hibernate that would help to associate a relationship between two different database tables. 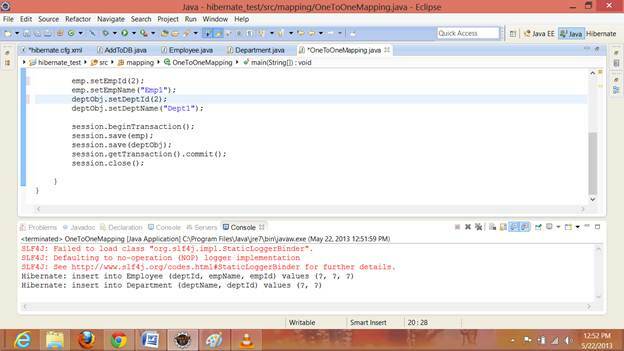 To learn, How to define mapping column name not same as class reference variable name. One to One Mapping: This kind of mapping defines the relationship between two tables using one attribute of each tables like relationship between empTable and deptTable related by empId and deptId. The attribute name deptId will be referenced by using refrence variable of referencing POJO class. In this case, we need to have two database classes, let’s name them as Employee and Department. deptId and deptName for Department class. Now create getter and setter methods for these classes. 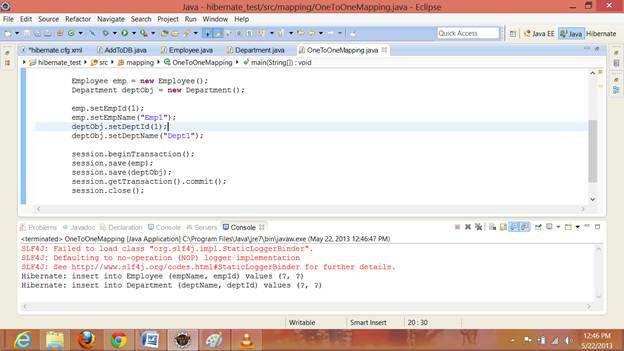 Use @Entity annotation before both of the classes, which is defined in the javax.persistance.Entity class. @Id before getEmpId() and getDeptId() methods defined in javax.persistance.Id class. @GeneratedValue is defined in javax.persistance.GeneratedValue class. Once these POJO classes are created as entity type, it is necessary to update mapping tag for these two classes into the hibernate configuration file named hibernate.cfg.xml file. To run and crate these classes into the database, we are required to have one more class , that is the java application class having the main method defination. This method contains hibernate connection and session management statement to handle these two class objects. This class name would be OneToOneMapping class. This class configures hibernate.cfg.xml file using Configuration class object cfg. Once it’s done. Create a Session refernce variable and initialize it with the new opened session using session factory object. Now crate two object for classes Employee and Department respectively. And initialize these objects using their setter methods. Once these objects are initiaized, save these objects into the session using session.save() method. And now commit the session transaction using session.getTransaction.commit() method. And at last close the session using session.close() method. 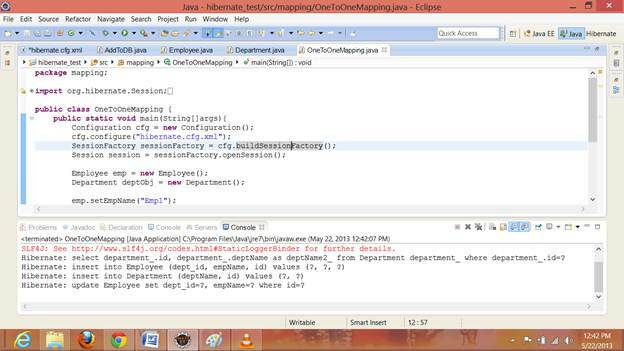 Above figure shows that two tables named employee and department were create, while run OneToOne.java file runs. In order to One to One mapping relationship between these two table, we have to use refrence of one database table named (Department) to another table (Employee). To define a One to One relationship using hibernate, annotation @OneToOne need to be place before the class refrence variable declaration or before the getter method of this refrence variable. Now, we are required to call the setter method for the deparment refrence variable into the OneToOneMapping class by passing the department class object. Now, let see the effect for One to One Mapping configuration between these two tables. 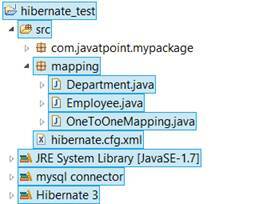 As figure shows that hibernate created an additional attribute to Employee table named dept_id, which maps the department id of Department table to Employee table. The column name dept_id maps to deptId of Department table. This is possilbe to rename the mapping column as user defined, not same as class variable name. This can possible by using annotation @JoinColumn and its attribute name and its value. How to define mapped column name not same as class reference variable name. Working in Software Development domain from 7 years now and is well equipped with programming languages like HTML, CSS, Java, PHP, .NET etc.